When you have a community of thousands of people, all actively contributing to a project, you need a system to evaluate each participant’s work in a way that is both scalable and easy to work with. One of the first things we had to do when we built Bountyhive was to completely tear down the current reward system and create a new, intuitive one from the ground up. You never change things by fighting the existing reality. Let’s first go through the old go-to system bounty managers used on Bitcointalk, also known as the “Staking System”. The bounty pool was first split into several smaller pools, one for each individual bounty type. Each bounty type then had a different staking system. You can quickly notice how this starts to turn into a chaotic mess, going back and forth from tokens to stakes and once you make a mistake, the whole thing blows up. This is taking into account that this is an extremely simplified version of it, but when you also consider that there are 5–7 campaigns in each bounty and the fact that every manager has his own rules, his own staking system — this becomes disorganized and very hard to keep track of. Scalability — After running one of the largest bounty campaigns, we were faced with a serious issue: While in theory, the staking system accounts for the difference in the quality, there is one thing it doesn’t account for — the difference in volume. 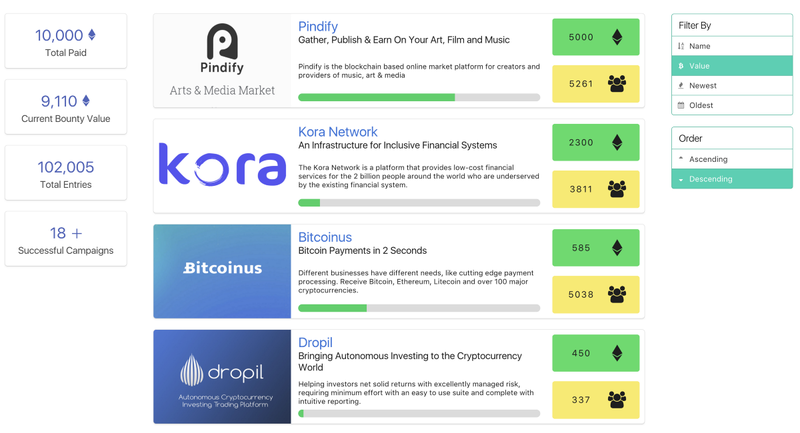 Even though the rewards for great quality submissions represent more stakes, the value of one individual stake has now been diluted and as such the actual reward for great quality content creators has stopped being directly proportional to the amount of work and is in turn more connected to the number of participants. This is because there are always exceedingly more low-quality submissions than great quality ones. A bad rating system — Due to the fact that there wasn’t any well-thought rating system, the bounty manager had to manually award a different number of stakes to each entry. Having to check over 10.000 participants for each ICO along with their respective entries and then awarding a different number of stakes to each one is a tedious task. In theory, the number of stakes shouldn’t differ that much, but you can often see stakes range from 1 to 50. The need for weekly reports — Just imagine participating in 10 Bounties, where you had to share 5 tweets a week for each. You now must submit 50 different links into 10 different forms. One for each campaign. This eats up an incredible amount of time. It’s tied to a weekly system — This adds to the previously mentioned issue. Since managers have to award weekly stakes to each participant, not only does this take their whole time and significantly reduces their productivity, but if someone enters during the very final moments of the campaign, the manager will have to award him, taking away from the bounty pool of the actual supporters. Besides that, the weekly system is in fact very confusing, prone to a lot of errors and also actively promotes the idea that a hunter can or should only participate for a couple of weeks before discarding the project, resulting in a lot of half-measured work. The result? 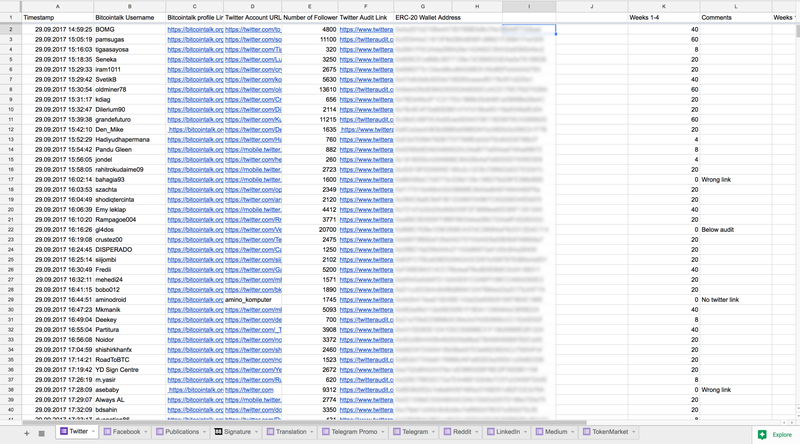 Monstrous spreadsheets, containing thousands or tens of thousands of submissions. There are countless issues with this system, if all were to be listed, we would need 2 articles just for this, but enough with the bad, let’s talk about the good. Before launching Bountyhive, we made a thorough analysis and noticed that no well-established bounty-hunting/freelance type of website (we are talking companies that are up and running for more than 10 years) was using this redundant staking system found on Bitcointalk — and for a good reason. It is so hard to leave — until you leave. And then it is the easiest goddamned thing in the world. Bounty Hunters are now put in well-established tiers, in which they can easily identify themselves! Every bounty type is split into several tiers, based on certain requirements, such as followers, friends or quality of content. Each individual tier has a certain percentage of the campaign pool allocated to it. After a hunter is declared as part of an individual tier, all the hunters who are part of that tier split the pool equally. This is a simple and elegant system, eliminating any sort of complications. №1 — Volume, bring it on! Since every individual tier has a certain percentage of the bounty pool allocated to it, the low-quality content tier can never dilute the great quality content tier or any other tier. When a new submission of great quality joins the great quality content tier, the reward is automatically recalculated for all of the members of that respective tier, resulting in a fair distribution for everyone. Join and start hunting right away! On Bountyhive there are no such things as spreadsheets, forms or reports. Instead, we’ve built an API to seamlessly connect your social media accounts once and never worry again. We take care of all that hassle. After you’ve initially set up your accounts, they remain active until you choose to delete them. In other words, you set it up once and then you can start hunting in all of the campaigns listed on Bountyhive! There is also no need for a “per week” view or a “spreadsheet” since entries are checked at the end, not in the middle of the campaign. Because of this, a “per week” system wouldn’t even be possible. Members of the same tier share the rewards among them equally and there can’t be any mathematical errors, as everything is automatically calculated by the system and then checked by 2 different staff members. Joining after the first half of the campaign has already passed takes you one tier lower. In other words, if you would normally qualify as a tier 3 but you are joining the campaign after half of it has passed, you will be treated and rewarded as a tier 2 participant. This is in order to encourage early supporters while also correctly rewarding later stage supporters. To ensure that no unnecessary dilution happens, new bounty hunters cannot join a campaign after a certain time has passed. Current participants continue their tasks until the end of the campaign but no new participants will be accepted. We are not “adding” to the duration of the campaign, instead we’re setting a specific date after which new entries are no longer accepted. This rewards the supporters who stood with the project from the beginning. Check out the LIVE Campaigns on Bountyhive! Following: Part II — How does Bountyhive work?